The home of all M1911 (or 1911, 1911A1, M1911A1, M-1911, M-1911A1 etc) pistols. An Internet reference, with all you ever wanted to know about the M1911, a magnificent firearm, designed by the most ingenious gunsmith of all times, John Moses Browning. If you are interested in learning more about this pistol, when it was designed, how it works, who makes it, what accessories are available, how it can be improved or customized etc., you came to the right place. 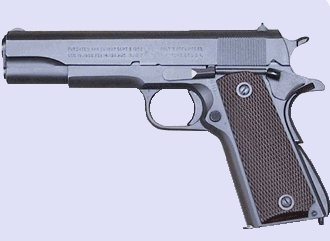 The M1911.ORG Home Page An on-line encyclopedia with information related to the M-1911 pistol, in a reference-style site. The M1911.ORG Forums Site A Forums site where you may discuss anything related to the M1911 pistol with other members. The M1911.ORG E-zine An electronic publication with all the latest news on the M1911 pistol, reviews of new M1911s etc. Select your destination from the links above, to proceed. We hope you enjoy your visit. Information about possible problems will be posted in that site, as well as the expected service restoration time/date.